Belgium & Germany to screen Luis Iga's Latinx, award-winning slasher which is becoming a cult classic and breaking diversity barriers in Hollywood. 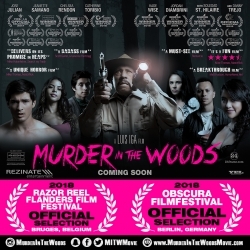 Los Angeles, CA, October 08, 2018 — Luis Iga’s Latinx, award-winning film “Murder in the Woods,” starring José Julián (“A Better Life”) and featuring Latinx icon Danny Trejo (“Machete”), will have its European Festival Premiere at the Razor Reel Flanders Film Festival in Bruges, Belgium on Saturday, October 27th (For more information go to: http://bit.ly/mitwrazorTixPR) and on Saturday, November 3rd at the Obscura Filmfestival in Berlin, Germany (For more information go to: http://bit.ly/mitwobscuraInfoPR). “Our goal was to make a horror/slasher film for a global audience to showcase ‘People of Color’ in lead non-stereotypical roles and we are excited that these two prestigious Horror Film Festivals in Europe agree with us,” said Director and Producer, Luis Iga. “I want to thank Patrick Van Hauwaert (Razor Reel’s Managing Director) and David Ghane (Obscura’s Festival Director) for being pioneers in reshaping how the world sees ‘People of Color’ and Minorities in cinema,” he added. “Murder in the Woods” is a production of REZINATE Entertainment, founded by Luis Iga. REZINATE partnered up with Yelyna De Leon to produce this film. Both graduated with an MFA in Film and Television Production from the School of Cinematic Arts (SCA) at the University of Southern California (USC) where they met.